There are a number of reasons for poor flowering, but 90% of the time it is due to lack of water. In most cases, the number one reason for lack of flower is due to lack of water. Many rhododendrons originate from monsoon areas of the Himalayas and are used to really moist conditions during June and July. This is when the flower buds are initiated for the following spring. By ensuring that your plants are moist in late June and early July, you are more likely to initiate flower buds rather than growth buds. See 3.2 watering for further details. All plants can take a year to settle into a new garden, but some of our choice varieties are not stocked by Garden Centres because they do not bud up and flower at a young age. In these circumstances, patience is a virtue! For instance the Loderi varieties can take up to six years to flower, and many of the rare big leaved species may need to be about 2 metres high before they show their first bloom. A number of rare species that we grow are shy flowering types, especially those of the taliensia subsection which are real collector’s plants not available elsewhere. 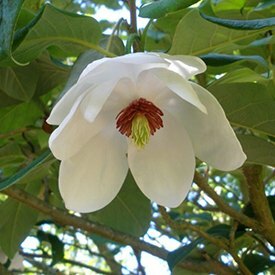 Enjoy them as foliage plants and regard the flowers as a bonus! Correct feeding is important to encourage flower production. We recommend Millais Ericaceous Slow Release Feed which has the correct nutrients for rhododendrons. See 3.3 Feeding for more information. Some feeds are high in Nitrogen which gives plenty of growth, but no flower. If you have fed and watered your plants well but still have no flowers, then try giving extra Potash and Superphosphate during the summer to slow down growth and to encourage flowering. Rhododendrons are often thought to be shade loving plants. Whilst this is partially true, they actually prefer lightly dappled shade, and are often planted in too deep shade which leads to weak growth and sparse flowering. For example, a number of gardens in Sussex and Kent had too much shade until the great storms of 1987 and 1991 which took out many tall trees, but this did enable rhododendrons to flower properly for the first time. 15-20% shade is about right, so if you have deeper shade, consider felling a few trees, raising the canopy (very effective) or moving your rhododendrons in the autumn to a sunnier spot. If the flower buds formed in the autumn, but turned brown during the winter, it suggests that you are growing a too tender variety and they may have been frosted. See 4.1.5 Frost. If the flower buds have turned black, and are covered with spikey black fungal growths, they are probably suffering from bud blast. See 4.3.1 Bud blast. Provided that rhododendrons are planted properly, with the correct feeds, deficiencies imbalances are unlikely. However, sometimes the leaves show that they are not as healthy as they should be, and hopefully this section will enable you to make corrections. This is where the leaves turn yellow but the veins remain green. This is usually a sign of lack of iron. Most people recommend Iron Sequestrine, but this is an expensive product and we would recommend Maxicrop with Iron for a quick improvement, followed by Iron Sulphate to give some longevity. Chlorosis of the leaf can also be caused by poor conditions such as drainage problems, soil pH or drought, so check these first. When the tip of the leaf is burnt brown, this usually indicates that too much salt (too much feed) has been applied. This could be due to too much fertilizer or too strong a compost such as horse manure. Probably best to replant in fresh compost without fertilizer for 6 months to allow the salts to wash through. When the side margins of the leaves are burnt brown, and perhaps curling under, then this is often a symptom of too high a pH (too limey soil). See 1.3 Rhododendrons on limey soil. Unless caught promptly, it is difficult to correct this problem, and the plant will get weaker and weaker until it dies. Your soil may be natural limey, or you may have a pocket of lime leaching out of a wall. Dig out, and replant in plenty of good ericaceous compost, or replace with INKARHO lime tolerant plants. Leaf scorch can be caused by incorrect nutrients, see 4.1.2 Nutrient Imbalances, or by the weather. Early autumn frosts can mark tender ‘second flush’ leaves which have not toughened up in time for the winter. Frost damage shows as brown markings on large sections of the leaf. Bright sunlight and high temperatures can also scorch young foliage in the early summer months. This is especially a problem after rainfall or irrigation. Avoid irrigation on bright hot days – it is much more effective in the early morning or evening. Stress caused by either too little or too much water can take 6 months or more for the effects to show on the plant, while it slowly gets weaker and weaker. This can account for what seems like ‘random’ failures at good times of the year. By the time you see rhododendrons with droopy leaves in summer drought, they are really under a lot of stress through lack of water. They need water fast, and they will pick up fast, but damage may have been done which will not show again for about 6 months when the plant starts to collapse. This is likely to be a problem after wet winters, or when planting in damp locations, especially when planting too low in the soil. The foliage may look dull and downward pointing, and the plant may lack energy. Replant in a higher location or dig extra drainage. See 3.2 Watering and drainage. This can be caused by frost damage with late spring frosts damaging the cells in the bud as they start to swell, resulting in odd shaped distortions in the leaves. It can also occur later in the season, when there is a second flush of new growth in July, but insufficient moisture in the bud through high temperatures or juvenile roots on young plants. Excess water during the growing season can also distort the cells as they develop. In all cases, the damage is purely cosmetic, and it will not harm the plant. Leaves can be removed if desired, but it is unlikely to happen in the following year when planted in the ground. The best way of avoiding serious frost damage is to select plants for your garden according to their hardiness rating. See 2.4 RHS Hardiness Ratings. However, everyone likes a challenge and tries to grow something that is marginal in some winters. We have found a number of west coast American varieties are not suited to the UK, because frosts continue here for so much later into the spring. The worst frosts are the late spring frosts which can damage flowers for a season, but a frost after a flush of early growth in May can cause bark split in stems which may require that branch to be pruned out. The first cold frost in the autumn after an ‘Indian Summer’ can also cause severe bark split in stems of less hardy varieties. Bark split occurs when the stem is full of sap and freezes hard, expanding to crack open the bark, like water in bottle. To prevent rotting and further damage after frosts, we recommend pruning off damaged flowers, wilted shoots and bark split stems. 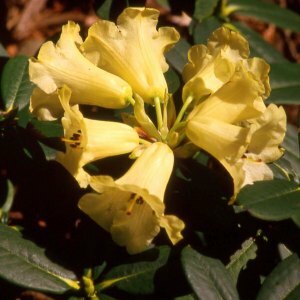 Rhododendrons can be prone to damage and death by Vine Weevil. Look out for tell-tale notching on the edge of Rhododendron leaves. This notching is usually very indented like a mini oxbow lake and often about 3-4mm in diameter, though sometimes more extensive. This damage is only cosmetic and is caused by adult weevils feeding at night during the summer months. The adult is a hard-shelled black beetle about 9mm long, which lives under leaf litter in hedges and under plants. It does not fly but walks everywhere. They are rarely seen and will drop to the floor if disturbed with a torch at night. They are always female and can lay up to 2000 eggs per year in the soil at the base of the plant. During the autumn and spring months these eggs develop into small white semi-circular grubs growing to about 5-6mm in length, with a red head. It is these grubs which feed on the tasty soft roots of rhododendrons, and they can eat all the bark away from the main stem just at or below compost level. This is usually terminal and the plant collapses, often quite quickly in the spring. The white grubs pupate into adults during warm spring weather and the life-cycle starts again. All plants that we produce are treated against vine weevil using natural nematodes at the propagation stage, and all our potting compost is treated to kill any grubs in the pots. We also treat for adults during the summer months, and we regularly apply millions of nematodes to our crops from spring until autumn. We are confident that our plants leave here inoculated against vine weevil damage. Caterpillars can feed on rhododendrons, sometimes dropping off overhanging trees onto the foliage, where they make notches on leaves which can resemble vine weevil damage. However, caterpillar notchings are more gentle and not as jagged, and sometimes even in the middle of the leaf. This is fairly cosmetic damage, and caterpillars do not kill the plants like vine weevil. See 4.2.1 Vine Weevil. 4.2.3 LACE BUG Stephanitis rhododendri. Rhododendrons are fairly unpalatable (and can be poisonous to sheep and dogs stupid enough to eat foliage in large quantities), so damage by animals is not usually a problem. Rings of chicken wire around vulnerable plants or new borders for a few years will normally offer sufficient protection. Deer are selective feeders, but if they find something they like, they will keep coming back to it that season. We have deer through our property the whole time but have found they only like grazing the following types up to a height of about 75cm: Camellias, evergreen azaleas, a few small leaved R. triflora varieties, and just occasionally some of the really late flowering hybrids which must be more tasty than the others. Rabbit populations go up and down depending upon myxomatosis, but they can eat the young foliage on evergreen azaleas and dwarf rhododendrons when there is little else for them to eat. Mice don’t cause a problem to larger plants growing outside but watch out for precious seedlings in greenhouses over winter! Pets (and children!) can cause a problem by being boisterous and breaking branches as they run through flower beds. 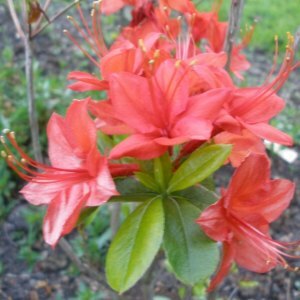 Some varieties are much more brittle than others, (eg Stenopetalum Linearifolium and nakaharai azaleas). If pets repeatedly use the same area as a toilet, this can create toxicity which shows as scorched leaves. If your Rhododendron isn't flowering and you can see some black buds, this could be either frost (see 4.1.5) or bud blast. If the problem is frost, the buds will be brown or black and smooth, and whilst a little unsightly, it is the result of weather conditions. If this happens regularly, it may be best to select a hardier variety more suited to your locality. Bud blast shows as small black hairy growths (like a hedgehog!) growing on the flower bud. It is a fungal disease which turns the flowering bud mouldy over winter and prevents flowering. It is spread by leaf hoppers (see 4.2.5) which are a pale green insect that appears between June and September. They have been seen in greater numbers in recent summers. Some varieties are affected more than others, but this varies from garden to garden. Certainly some mauves seem worse, and those more associated with R. ponticum. Powdery mildew was a considerable problem to certain groups of rhododendrons around 1990. Plants such as R. cinnabarinum were decimated and killed in areas where there was high humidity such as the Western seaboard of the UK. Nowadays, the most prone varieties are not grown, and plants seem to have developed greater resistance so the disease is not the problem it once was. Powdery mildew fungi produce microscopic air-borne dispersal spores which have a high water content, enabling them to infect under drier conditions. Powdery mildew is associated with water stress and is characterized by dark brown or black spotting on the upper and lower surfaces of the leaf. Marks are usually round, and often have a paler halo on the outside. The powdery white fungal spores can sometimes be seen on the leaf underside. Left untreated, these can spread across large areas of the leaf, weakening the plant, and causing leaf drop and plant death. Take special care in May-June and August-September when average temperatures are about 15°C and humidity is high. Deciduous azaleas with R. occidentale parentage can be prone to powdery mildew in early September. These fungal diseases have received a lot of publicity in recent years, and in USA are known as Sudden Oak Death. These are serious diseases that can affect a wide range of plants including Rhododendrons, Camellias, Viburnum, Pieris, Kalmia, Larch and Taxus. They are rare in private gardens, but worse in areas that have warm and humid summer conditions such as the Western regions of the British Isles. Recognition is difficult and can be confused with other diseases, and even normal winter maturity and change of stem colour. Shoots become darkly discoloured, and the blackening extends into the leaf stalk, and through the leaf. Symptoms include the wilting and death of a branch or part of a plant. There is little doubt that ramorum dieback is mainly associated with R. ponticum (the mauve ‘wild’ rhododendron), especially where it has become overgrown. Preventative clearing of all R. ponticum, and any hybrids which are closely related, is certainly recommended to prevent this devastating disease. If these diseases are discovered, the plants and those nearby will be destroyed. All UK nurseries with susceptible crops are subject to regular stringent plant health checks by APHA. Our Nursery has four inspections each year and by operating a tidy and hygienic nursery, we have a clean bill of health. Our philosophy is to select and grow strong healthy plants which are not prone to disease, and to grow them in a clean nursery with excellent drainage to prevent water splash onto the foliage. We adopt organic practices wherever possible by spraying our plants with our own compost tea, complimented by other non-chemical products such as seaweed, natural copper in minute doses, tonics, sulphur, citrus seed oil and garlic. These products fight and deter disease so we can be sure we grow and despatch only healthy plants. 4.3.4 PHYTOPHTHORA ROOT ROT Phytophthora sp. Phytophthora species are microscopic fungus-like organisms which cause root rot and decay at the base of a plant stem. They are associated with heavy or waterlogged soils, and symptoms show as wilting, poor and yellowing foliage and shoot die-back until the whole plant collapses. In severe cases, a reddish brown discolouration can be found when cutting into the stem at the base of the plant. Phytophthora spreads by tiny spores that swim in water and wet ground. Resting spores can remain in the ground for several years, so care should be taken when removing dead plants and the associated soil to ensure that this is all disposed of, and fresh soil brought in. Honey fungus is the most destructive fungal disease in the UK. It attacks the roots of many different woody plants and is characterised by white fungal growths between the bark and wood near ground level and clumps of ‘honey coloured’ toadstools in the autumn around infected plants. It spreads underground, developing brown or black rhizomorphs (‘bootlaces’) which spread the fungus from plant to plant at the rate of about 1 metre per year, killing the roots and decaying the dead wood. To reduce the incidence of honey fungus, it is worth considering stump grinding and removal of any felled or dying trees, especially on damp heavy soils. Rhododendrons can be prone to a variety of different leaf spots, and plant collectors have noted these even in the wild. Many are cosmetic, and whilst they may be unsightly, they cause little long-term damage. Using just the naked eye, it is not possible to tell if a leaf spot has a fungal or a bacterial origin, but under magnification, tiny dot-like bodies associated with the lesions would indicate fungal spore-bearing structures. Fungal leaf spot symptoms are caused by the death of cells around the infection, and these often enlarge as the pathogen spreads. Pycnidial leaf spot diseases include Pestalotiopsis, Coniothyrium, Phomopsis and Phyllosticta show symptoms on the upper leaf surface but spreading is by spore-bearing pycnidia within the leaf. This makes control more difficult and requires translocated fungicides. Spores often spread from infected fallen leaves, which mature in spring, ready to be splashed onto newly emerging leaves. Infection is spread in damp wet conditions and develops in warm humid conditions. This is a fungal disease which disfigures the leaves of evergreen azaleas and is spread by airborne spores. Irregular shaped galls vary in size from that of a pea, to a small plum, and form mainly on leaves, but also on flowers. They are pale green at first, later becoming white which is a superficial coating of fungal spores. Spores can be spread to healthy plants by insects or by air.